Enroll now to watch the recording of the inspirational Shai Maestro's class, which happened on October 11, 2017. The class flowed from questions asked by the in-studio audience, and ranged from practicing, inspiration, and composition. Later on, Maestro enrolled to the Thelma – Yellin High School of Performing Arts in Givataim, Israel, graduating with honors. While taking extended literature classes, Shai was one of the few students combining a major both in the jazz and classical departments along with his regular studies. Maestro later on continued his classical piano studies with Prof. Benjamin Oren of the Music Academy in Jerusalem. After winning the National Jazz Ensembles Competition “Jazz Signs” in 2002 and 2003 and receiving excellency scholarships 2004-2010 from the America-Israel Cultural Fund for jazz piano, Maestro attended Berklee College of Music’s 5 week Summer Program in Boston where he was awarded a full scholarship to attend the full time (4 years) program, but Maestro never took this offer. A few weeks later, Maestro received a phone call from bassist Avishai Cohen (known for his long time collaboration with Chick Corea as well as for his successful band leading career) offering him to start collaborating together. Maestro joined Avishai Cohen’s Trio together with drummer Mark Guiliana where he played for 5 years around the globe. Playing with Mr. Cohen from 2006 to 2011, they recorded four albums together (“Gently Disturbed, Aurora, Sensitive Hours and Seven Seas”) two of which are for Blue Note records. They toured the world intensely, playing at some of the world’s most known venues and festivals such as the The Olympia Hall, Salle Pleyel, the Bataclan Theater, Jazz á Vienne, Marciac Jazz festival, Cork Jazz Festival, Yoshi’s, Madrid Jazz Festival, Blue Note in NY, Ronnie Scott’s, Vienna’s and Berlin Concert houses to name a few. 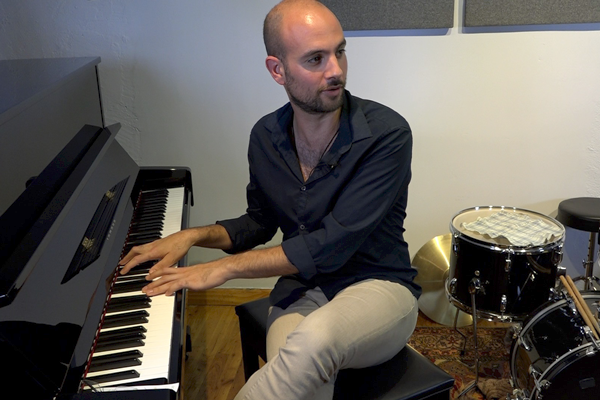 Additionally, the Shai Maestro Trio was formed in July 2010 in Brooklyn after a music session at Maestro’s practice studio. Only a few months later the trio went into the studio to record their first album simply named “Shai Maestro Trio” for the French label Laborie Jazz. The album was received incredibly well by the public, media and peers. Intense tours followed immediately and the trio began traveling the world, playing 60-80 concerts a year. Sharing stages with Chick Corea’s group, Tigran Hamasyan’s quintet, Esperanza Spalding’s group and Diana Krall’s band, the band made a real impact everywhere they played. In 2012 the trio released it’s second album – “The Road to Ithaca” also for French Label – Laborie Jazz, receiving rave reviews. Maestro’s trio has released it’s 3rd and most recent album “Untold Stories” in October 2014. Received in open arms by listeners and the media (Notably by Downbeat Magazine, NPR and WBGO’s – The Checkout among others), the trio presents a combination of live recordings alongside studio work, the trio showcases it’s most mature statement so far. Constantly composing, arranging, exploring and discovering, Maestro will soon release his 4th album which will be his most ambitious project yet, featuring an extended group of musicians. “Even though we have been playing together for quite some time now, it feels like the beginning. I’m very curious to see where the road will take us” says Maestro. Shai Maestro can be found performing and recording with international artists such as John Patitucci, Theo Bleckmann, Jorge Rossy, Mark Guiliana, Donny McCaslin, Ben Wendel, Anat Cohen, Marcus Gilmore, Antonio Sanchez, Avishai Cohen, (trumpet), Avishai Cohen (Bass), Scott Colley, Ari Hoenig, Gerald Clayton, Justin Brown, Keith Carlock, Gilad Hekselman, Johnathan Blake, Camila Meza, Clarence Penn, Antonio Hart, Matt Penman, Harish Raghavan, Julian Lage, Jorge Roeder, Matisyahu, Kenrick Scott, Nate Smith, Nir Felder, Nate Wood, Jo Lawry, Will Vinson, Linda Oh, Joe Sanders among many others. Enroll and register for immediate access to the 64-minute class recording.